Gold Mining Services in California's Premier Placer Gold Mining Company - Invest in California Gold Call - Call 661.724.MINE ! Our services are superior to any other throughout California, Arizona and Nevada. From hand tramming, hand mucking, hand drilling to 21st century mining, we have covered it all. Trained at the early age of 21 by one of the best mining contractors in the United States and by top notch mining engineers, the hired operations manager,boasts over 31 years of experience each, and to some, considered the upper echelon of mining expertise. Our services rival billion dollar companies for a fraction of the price, usually with faster and better results. Our equipment manufacturing partners manufacture the only commercial production, specific gravity, concentrating wheels in the world. 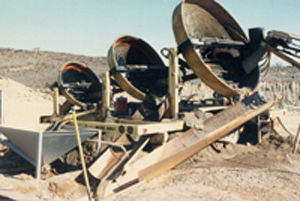 With calls coming in from Ghana Africa, Saudi Arabia, Mexico and the United States, placer mining operations are asking for this concentrator over all other concentrators, the Modern Technology Engineering Concentrating Wheels. Working for years with different municipalities, counties, cities, state, federal and security agencies leaves us as the epitome of consulting groups. Receiveing calls from California, Arizona and Nevada to prove up or disprove mining and milling properties and operations from investor groups. We are known to tell it how it is, whether good news or bad news. Full due dillengence packages are digital for ease of use. Our featured service is Modern Technology Engineerings Specific Gravity Gold Concentrating Wheels. They are made for commercial production placer mining. These 8', 5' and 3' trailered combination concentrating wheels, puts all other production concentrating units to shame in several ways. With the highest concentrating capabilities in the world in its price class, MTE's concentrating wheels have continous recovery (no shutting down to clean out), do not use electricity (about 5 gallons of fuel per day), use less water than jigs and bowls(About 60 gallons per minute recycled), less labor, lesse quipment, less heavy equipment fuel, no wiring, considered Green Mining, 1 unit from MTE($120K) is equal to 4 comprable jig or bowl units($400K-$800K). This technology is endorsed as an Environmentally Friendly Green Solution. Catch more gold and more black sand concentrates with the largest commercially proven, specific gravity, gold concentrating wheels in the world. MTE's Concentrating wheels capture very fine gold. This pan used to hold one ounce per 60 yards. Now it holds 2 and 1/3 ounces per 60 yards.